The Lightning was designed to defend mainland Britain against jet bombers. The point defence role required speed and climb rate over endurance, and the Lightning was certainly successful in these respects. 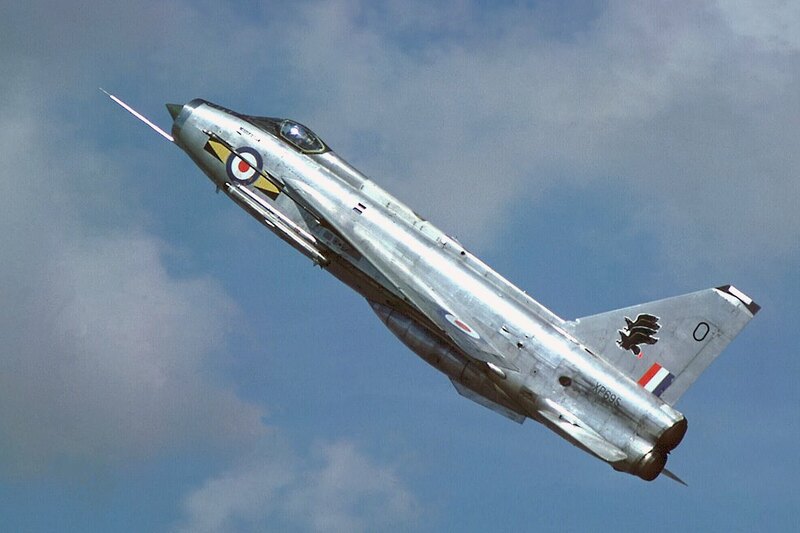 English Electric Lightning. Three words which sit so beautifully together (ignoring the tautology of ‘electric’ lightning). The charged air of English skies ripped apart by riveted lunacy. 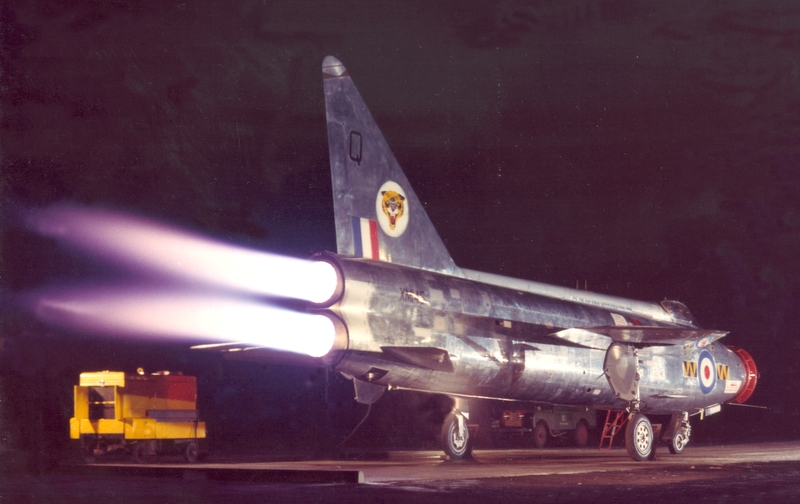 The Lightning was quite mad: a greedy machine set on eating fuel and turning it into speed. Unlike anything else its two Avon engines were stacked one on top of the other making it stand monstrously tall on the ground. The unique stacked engines created less drag than side- by-side engines. If one was to fail the thrust would still be on the centreline (in theory this was safer, though would put a lot of strain on the surviving engine). The Lightning would scorn today’s tedious drones controlled by gamers in porta-cabins. The Lightning was the anti-thesis of the UAV- it was essentially a manned missile, tricksy and twitchy – and it killed more of its own pilots than it did enemies (it actually did not see combat). 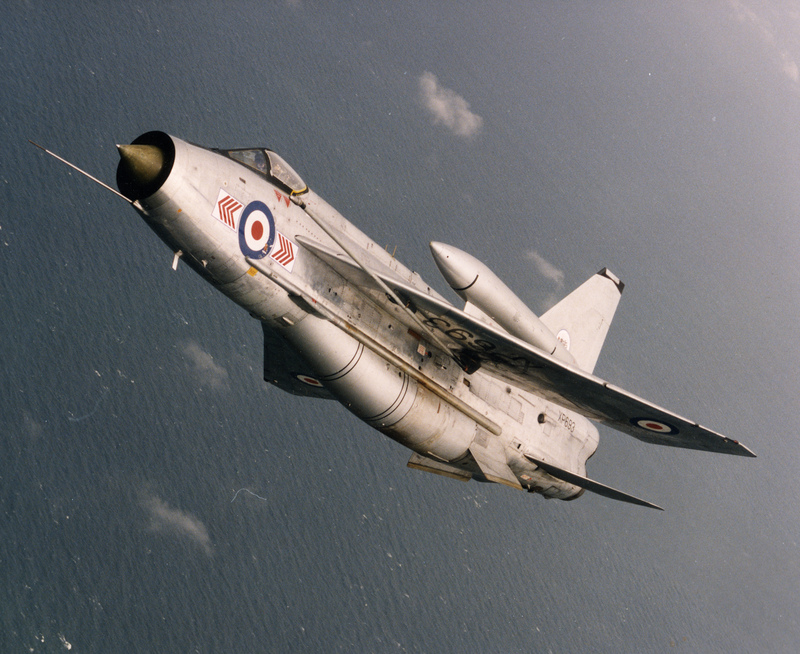 When it entered service in 1959 it could outfly and outfight any of its peers, but failure to adequately upgrade the Lightning made it obsolete, while its performance was still unbeaten. Its astonishing maximum climb rate of 50,000 feet a minute was not equaled by a Western fighter until the F-15 entered service in 1976. While other fighters were getting Pulse Dopplers and radar-guided missiles, the Lightning was stuck with an antiquated radar and a missile armament of only two equally old-fashioned missiles (the contemporary F-4 Phantom II could carry eight). When it was retired it 1988, the Lightning still did not have the ability to carry chaff or flares (essential for survival) or a radar warning receiver (which alert the pilot to the presence of hostile radars). The Lightning was Britain’s first, and only, Mach 2 fighter. Flying the Lightning was the most sought after position in the RAF, it was a delightfully exhilarating and agile aircraft for those brave enough to fly it! All Images of the English Electric Lightning, supplied by BAE Systems Military Air and Information (MAI). company Thunder City provides civilians the chance to fly in a Lightning. Any good? Its phenomenal performance was marred by its poor endurance and weapons systems. As a point defence intercepter it was excellent. An early assessment against the US F-106 left the Lightning pilot with the impression that he had the best fighter in the world. By the late 1960s, it was behind the technology curve. Rivals? There was no direct equivalent to the Lightning. Mirage III, Mig 21, F-104 were rivals. Good write up on a great plane. Some specialists could give more details about drag reduction due two the engines position? Other thing i had never thought before, with engines positioned like that, one is much less vulnerable from ground to air fire! We can say that one is totaly protected by the other one. And yes, no yaw movement in case of failure of one. All these, leads me to ask a question. Why all twin engines don’t use this engines settlement? Actually, the Lightning WAS used in combat–just not by Britain. Saudi Arabia used theirs against Egypt, mainly in the ground-attack role, between 1968 and 1981. My maths teacher’s first job had been to design the windscreen for the lightening – no easy job when speed of that kind hadn’t really been associated with any sort of visibility prior to 1950. Bullets not needing windows etc. They still used one as a chase aircraft at Warton when the Tornado program was underway, but it’s performance so outstripped the test vehicle that the landsharks’d have to circle around the airfield building up speed so the lightening wouldn’t out pace them as they roared into the air. And how they roared! To say the Lightning never saw combat, well can you say QRA is combat? I will let you decide?